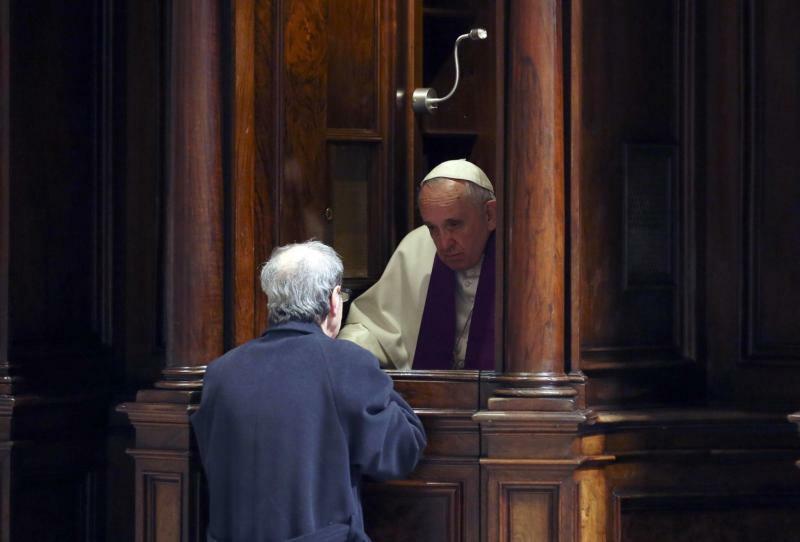 VATICAN CITY (CNS) — Hear confession every time someone asks, Pope Francis said, and don’t ever put limited hours on the sacrament of reconciliation. “Please, let there never be those signs that say, ‘Confessions: Mondays and Wednesdays from this time to that time,'” he told hundreds of confessors and other participants attending an annual course sponsored by the Apostolic Penitentiary, a Vatican court that handles issues related to the absolution of sin. “Hear confession every time someone asks you. And if you are sitting there, praying, leave the confessional open because God’s heart is open,” he said March 17. Confession “is a pastoral priority,” and is a daily call to head to the “peripheries of evil and sin, and this is an ugly periphery,” he said. A good confessor, he said, has begged God for “the gift of a wounded heart, capable of understanding others’ wounds and of healing them” with God’s mercy, he said. Accompany men and women “with prudent and mature discernment and with true compassion for their suffering, caused by the poverty of sin,” he said. So much harm is done to the church and human souls when a confessor is not guided by prayer and the Holy Spirit in discerning what God wants to be done, he said. “The confessor never follows his own will and doesn’t teach his own doctrine,” but is called to be God’s servant in full communion with the church. Be ready to use confession as an opportunity to evangelize and remind people of the basic, essential truth of faith and morality. Pray to God for the gift of humility and the recognition of one’s own sins that God fully pardoned, he told them. Pope Francis also asked confessors to be very careful in discerning whether a person may be suffering from a mental disorder, “which must be verified through a healthy cooperation with” experts, or from demonic influence or possession. Whenever a confessor recognizes the presence of evil spirits, he said, never hesitate to refer to an exorcist, who is charged with “this sensitive and necessary ministry” in each diocese. One of the parishes had confessions every Wednesday from 6:30 to 7:30. That was one I would go to regularly. Unfortunately they discontinued it. Saturdays are often difficult to get to. The priests in the Archdiocese of Philadelphia have discouraged confessions by having them 45 minutes before the Saturday night Mass. The priest is in a hurry to get to the Mass, and that is not his fault, per se. That is all the time allotted. There are some people who need more time to confess and may take up all the other parishioners time and they go away discouraged for not confessing serious sins. The confessions should be on Saturday morning from 10:00 to noon until the people get used to this new schedule. Some of the more lazy priests will say after a few weeks that this is not working. The Archbishop has to demand this of his priests. After all, it was his lazy priests who destroyed the Sacrament by insinuating it into a small time slot before Mass.